Asthma. It’s a health condition that’s been around for decades, and everyone knows someone who has it. But don’t be fooled. Even though asthma is a common illness, not everyone has asthma figured out, not even health care providers. In Beating Asthma: Seven Simple Principles, allergist Stephen Apaliski, MD, provides a straightforward plan for combating an illness that more than 25 million Americans struggle with every day, 30% of them children. What’s new about this book compared to others in the marketplace? It provides an inside look at treating asthma from the allergist’s perspective. What many people don’t know is that asthma outcomes are better when patients work with specialists such as allergists or pulmonologists. In Beating Asthma, Dr. Apaliski shares the seven most potent strategies that he and many other allergists use for getting patients’ asthma back under control. These strategies range from understanding the problem—asthma is a chronic condition that must be managed every day—to using the right tests at the right time to stay on top of your lung health. Asthma patients (and asthma parents) are also instructed on how to design a customized asthma-action plan that identifies when a patient is safely in the green zone versus the red zone—when an emergency call to 911 must be made. 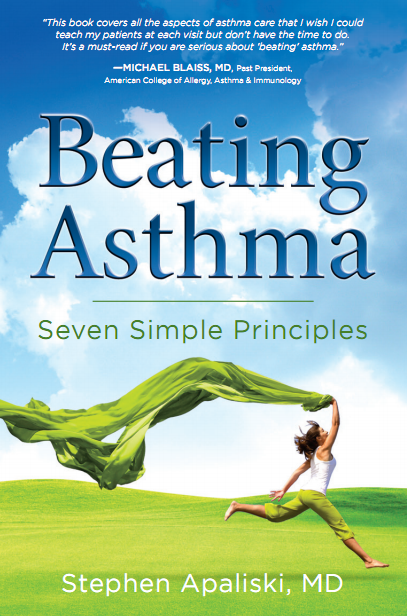 Beating Asthma represents one of those must-have, no-nonsense books for anyone with this particular health condition. It’s for those who have been struggling with asthma for years who seek a better way, as well as those who have been recently diagnosed. Even those with mild asthma can benefit; the book’s strategies are like a life-insurance policy against that one unexpected day that an acute episode of asthma pops up. Unfortunately, triggers such as chemicals, air pollution, allergens, and even certain medications can all cause serious, surprise attacks. StyleMatters had the pleasure of helping Dr. Apaliski develop the outline for Beating Asthma as well as edit the manuscript, lay out the text, and design the book cover and website. Are we biased in our positive review of the book? Maybe. But if you or a loved one has asthma, don’t let that bias get in your way. Beating Asthma may just be the most important book you purchase this year. This month is National Asthma month: spread the word about this helpful guide for those you think may care by letting them know about www.beatingasthma.com.